Chainsaw Exorcism with Blogger Creed Noir of Machinations Into Madness about upcoming Film Festival "Mass Hysteria"
Creed Noir is the face of Machinations into Madness. He embodies the unique brand of this blog and personifies the themes of Madness, Paranormal & Occult, and the Macabre that Machinations into Madness holds dear. Creed Noir is hosting a terrifying and twisted film festival called Mass Hysteria. Dead lines for entry is May 12, 2014. The following is a transcript from an interrogation with Creed Noir. Could you tell me about yourself and Machinations Into Madness? Psychological Horror is something I have always been fascinated with. It's not the cheap jump scares, the endless gore, the torture of someone we don't know, or the random pursuit of body counts. It's what's going on in the mind that can be the scariest. It is this reason that Edgar Allan Poe and H.P. Lovecraft are credited as major influences on myself and Machinations into Madness. It is the fear of the unknown, the madness, the paranormal & occult, and the macabre. I've been a filmmaker for nearly ten years, but I will be making my first true foray into the Horror genre with my anthology 'Creed Noir's Exposition of Horror' (http://machinationsintomadness.com/expositionofhorror). This project will serve as a bedrock for all future endeavors I work on. Why do you write? What inspired you to blog? I started Machinations into Madness because... well I love Horror. It's also relatively inexpensive to do when compared to filmmaking or conducting photoshoots. It's a great way to get noticed with weekly content generated and it allows opportunities for networking that otherwise as a filmmaker I may not have been able to obtain. The second writer that joined Machinations into Madness was Sue Rovens. She is a horror author known for her book 'In a Corner, Darkly'. She writes about real world strange and the culture behind Horror and as such heads up our CULTure column. Working with these two makes me want to continue blogging. It's great motivation like this that inspires me and makes me want to continue blogging. I get to control everything that is happening. There's rarely an unexpected event when writing. When involved in filmmaking anything and everything usually goes wrong. I used to think losing my mind. But you know what? The more I think about it, the more I think it would be blissful to be ignorant of the world. What character in a horror movie do you most identify with and why? There's no one character that strikes out at me. I love the loner, the outsider. The one who has all the answers to all the questions people are afraid to ask. I despise the childish drunken teens or 20 somethings in Horror we usually find. 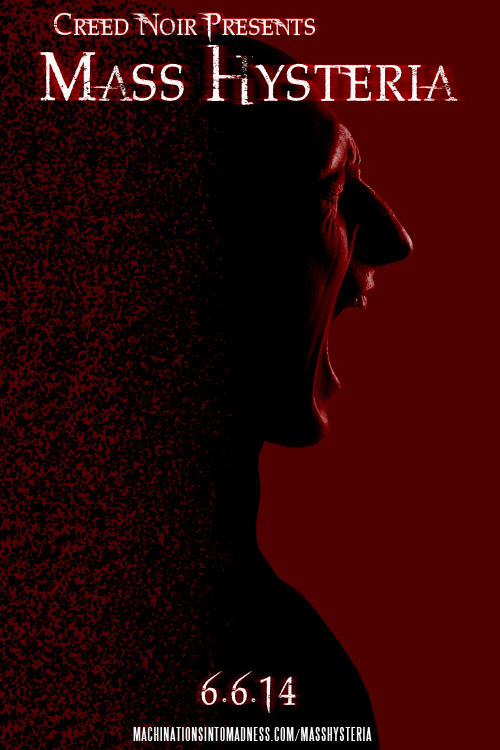 For the fans of Horror, 'Creed Noir Presents Mass Hysteria' is a show that brings great trailers, short films, and features produced by Indie Horror Filmmakers. For the filmmakers out there, its a chance to get your work screened in front of people who might of otherwise never would of watched it. Unlike other film festivals where filmmakers need to pay a submission fee, Mass Hysteria is free. There are no entry fees! It really comes down to selecting the best work for the show. I take a look at each submission with my Machinations into Madness manacle. I judge each submission based on production value, story telling ability, lasting impact (does it make me think about it after it ends), and how well it reflects upon the themes of Machinations into Madness (madness, paranormal & occult, and the macabre). The actual mechanics behind 'Creed Noir Mass Hysteria' is different from most traditional film festivals. The show will be streamed live. So that means people will have to go to the show's website and watch it as if they were in a theater. I think this brings importance and intimacy to Mass Hysteria. We will also have the ability for audience members to chat with one and other during the show and even ask me questions live. As this is a global endeavor, the filmmakers of the projects being screened will also have the opportunity to participate. Creed Noir Presents Mass Hysteria will not be available via VOD or otherwise made available after the show ends. Filmmakers looking to submit an entry to 'Creed Noir Presents Mass Hysteria' can do so by visiting the page http://machinationsintomadness.com/masshysteria/. Deadline for entries is May 12, 2014. A list of the entries chosen for the show will be made public no later than May 26th. Machinations into Madness (http://machinationsintomadness.com) is the place to go for news about up coming events, interviews with filmmakers, looking at the psychology behind Horror, and of course real and fictional articles about madness, paranormal and occult, and the macabre.